It is true that there is more glamour attached to batting than bowling. However, a bowler's task is far more severe in physical terms than that of a batsman. To become a good bowler, it is normal and wise for a youngster to determine what type of bowling is likely to suit him the most. Once he does this, the hard work should commence. One of the first things a bowler should realise is that for every wicket he takes, he is sure to send down a certain amount of balls and concede a certain amount of runs. There are many ways of dismissing batsmen, but statistics reveal that over 50% of them are out 'caught'. Hence, bowlers must learn to utilise their fielders well. Never run them down. It is the bowler who in conjunction with his captain decides where the fieldsmen will be stationed. A bowler should be more than a mechanical propeller of a ball. He who can assess the strengths and weaknesses of his opponents and accordingly vary his methods to achieve the best results will have a headstart on his less-observant rivals. A bowler's priority should be to 'attack' - get the batsman out. Very rarely does an all-out negative approach work. It is only natural for the bowler to want the field to be set in a particular manner, but if the captain has a good reason to make an alteration and insists upon doing so, the bowler should obey him and do his best. After all, the captain is the boss. Loyalty to him is essential. An erratic fast bowler can sometimes get away with punishment, but slow bowlers seldom get an opportunity to come back. The basic essentials for bowling are LENGTH and DIRECTION. They are followed by secondary factors like variation in pace, flight, spin, swing etc. The ball should be grasped in the fingers and not the palm. After a youngster has made up his mind on whether he wants to bowl fast, medium-fast or slow, he should decide on the most appropriate action for his delivery. The purpose of a bowling action is to enable the release of the ball from a comfortable and well-balanced position, whereby the maximum efficiency is obtained from the coordination of the fingers, wrist, arms, shoulders and body. The run-up should be of the precise length required for the purpose, not too short and certainly not too long. It should be smooth. A bowler should not experiment too much with it in his formative years. The run-up need not be straight. It could be angular. Everything boils down to what the bowler in question is comfortable with. A fast bowler should aim to achieve the maximum momentum at the point of delivery and get the body into the best position in order to put punch into the delivery. All types of right-handed bowlers seem to place the right foot parallel to the bowling crease in their delivery stride. The body should turn so much that the left side should point towards the batsman. The left arm pushes upwards, the weight is transferred onto the right foot and the body leans backwards. The head should be steady and upright, looking down the wicket over the left arm. The left leg being raised slightly off the ground is part of the 'winding up' of the bowling action. As the left leg hits the ground, it is braced to take all the weight and also the force of the right arm delivering the ball. The head should be kept up and the right arm should swing towards the batsman after delivery of the ball. The bowler should quickly move away from the pitch on their follow-through, so that they do not damage it with their boot spikes. If they keep stepping on the 'danger area', the umpires can stop them from bowling after a couple of warnings. Most fast bowlers have a drag. This enables them to retain body balance. Quicker bowlers would do well to "keep the arm high". Delivery from a higher point will help fast bowlers and medium-pacers extract 'lift' off the pitch - a most valuable asset. No batsman likes the ball to rise sharply after bouncing. 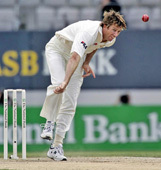 Spin bowlers usually release the ball from a slightly lower point than fast bowlers. This to an extent makes it easier for them to turn the ball, and enables them to vary their turn and pace.